Eloy Alcala listens to closing arguments in his capital murder trial in the 275th state District Court at the Hidalgo County Courthouse on Thursday, Oct. 18, 2018, in Edinburg. 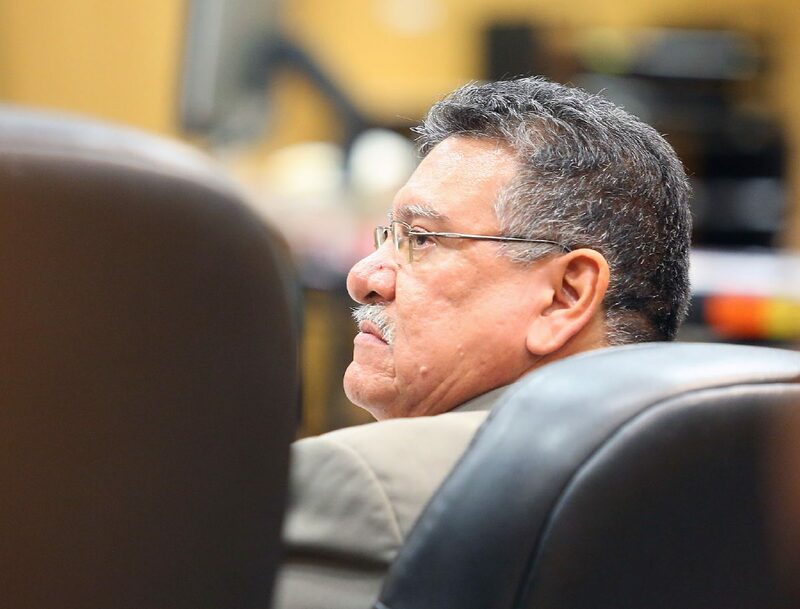 EDINBURG — Eloy Heraclio Alcala was found guilty of capital murder for a second time in a six-year span Tuesday, when a jury reached a verdict after more than 22 hours of deliberations. Alcala, 51, was first convicted of capital murder in the shooting deaths of Victor De La Cruz, 35, and David Garcia, 21, during a 2012 trial, a conviction the 13th Court of Appeals later reversed in 2014. After four years of delays and resets, his second trial began Sept. 27 and lasted four weeks, during which the Hidalgo County District Attorney’s Office called new witnesses to the stand in an attempt to secure another conviction. Retired state District Judge Romeo Flores presided over the trial, which was assigned to judge Mario E. Ramirez Jr.’s courtroom. Ramirez was on hand during the deliberations, with state District Judge Israel Ramon Jr. ultimately being the one to receive the verdict. Members of De La Cruz and Garcia’s families, in addition to Alcala’s own family, sat patiently outside the courtroom during the four days of deliberations, which began late Thursday and ended Tuesday afternoon. Before the 12-member jury broke for lunch Tuesday, Ramirez read them the Allen charge, an instruction ordering them to continue deliberating when unable to reach a verdict. Earlier notes the jury sent to the court seemed to indicate they were unable to come to a unanimous decision. Alcala has maintained his innocence since his Oct. 8, 2010 arrest just hours after De La Cruz and Garcia were found fatally shot at a Las Milpas intersection. There were no eyewitnesses to the 1:30 a.m. shooting, and neighbors who called 911 after hearing gunshots reported seeing a truck flee the scene. Based on information provided by Garcia’s mother and sister, who arrived to the scene minutes after Pharr police, police pinpointed Alcala and his son as suspects. Assistant District Attorneys Carisa Rivera Casarez and Monica Baron Auger, an ADA in the 2012 trial, argued that Alcala and his son, Eloy Jiovanni Perez Alcala, shot the men in retaliation after Garcia and Jiovanni got into a physical altercation. Jiovanni, now 29, was convicted in a 2011 trial and is serving a life sentence. Defense attorneys Daniel Reyes and Jaime Alemán, who both represented Alcala in 2012, poked holes in the prosecution and Pharr Police Department’s theory of the case and the Alcalas’ motive. “The problem with the theory is that it only wants you to look at what fits in that story and it wants you to disregard anything that does not fit …” Alemán said during closing arguments Oct. 18, charging the prosecution with “asking (jurors) to take a leap of faith” and “do the work” Pharr police had failed to do. Throughout the trial, the defense pointed to discrepancies between police officers’ reports from 2010 and statements made eight years later on the stand, as well as inconsistencies in the stories told by De La Cruz’s brothers and Garcia’s sister, all of whom took the stand for the first time during the second trial. Alemán emphasized that after four weeks of testimony and hearing from more than a dozen witnesses, jurors still lacked a clear timeline of what transpired in the hours leading up to the shooting. He charged Pharr police with conducting a botched investigation in which a murder weapon was never discovered and certain evidence, namely blood discovered in Jiovanni’s car, was never submitted for forensic analysis. Alcala was automatically sentenced to life in prison without parole. He is expected to appeal his latest conviction and on Oct. 30, Ramirez will hear Alemán’s motion to withdraw from the case and appoint an appellate attorney.